Governor Larry has set a goal of identifying best practices for bringing in and engaging new members. Here we will keep a list of practices used to bring in new members by our clubs in Southern Connecticut. 1. Use the Rotary Club Heath Check to assess your club and determine what your club is doing well and where you might want to make some changes. 2. Discuss and create a vision for your club to decide what you want your club to be line in the immediate future and in 3 – 5 years. Take your club through this process in a fun and new location to foster innovation. 3. 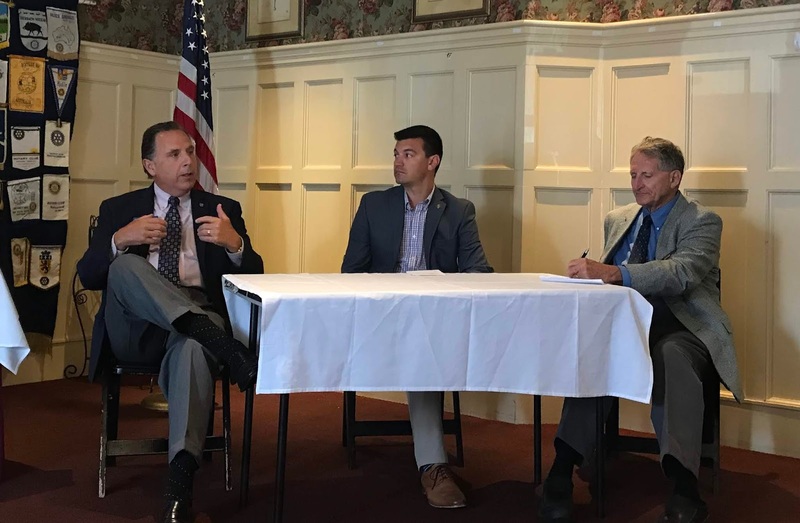 Consider varying meeting times and locations, loosening attendance rules reducing fees for new or younger members, varying service projects, and allowing for different kinds of membership. 4. In talking to prospective members, consider their interests and needs to explain some of the most popular benefits of Rotary membership: community service, friendship and connections, family involvement and international focus. 5. Use digital communications to promote your club and attract members. Does your club have a website? A Facebook page? Do you update them regularly? Have you joined conversations in LinkedIn? Use the power of social media to reach a broad audience. 6. Post an upcoming club service project or social activity as a Facebook event. 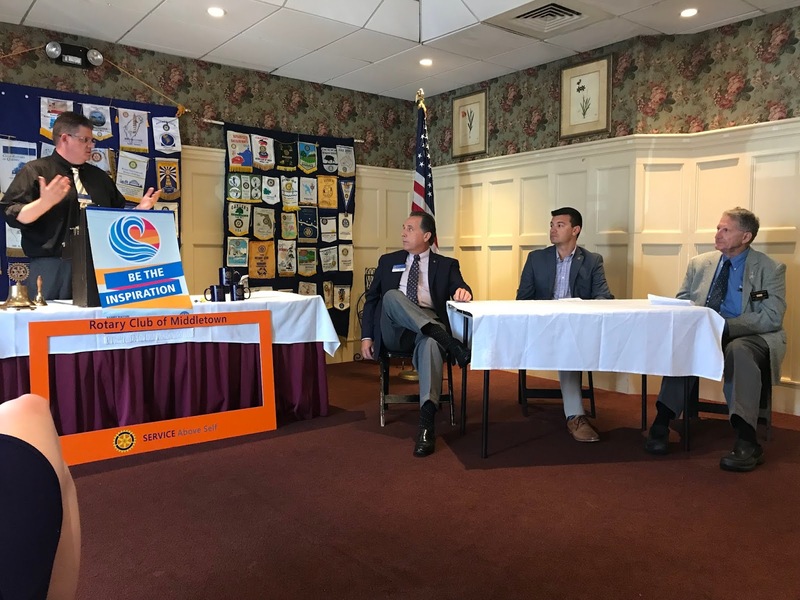 This is a good way to connect with people in your community who are not familiar with Rotary and may be interested in getting involved. 7. Invite a prospective member to a club service project or event, so that she or he can see that your cub is active and involved in the community. Assign a member to contact the prospective members after the event and invite them to a club meeting to get to know the club. 8. Partner with local organizations like young professional networks or professional women’s organizations to identify prospective members. 9. Consider young professionals who have participated in Rotary’s programs such as former group study exchange or vocational training team members, Ambassadorial Scholars, Rotary Peace fellows, Rotary Friendship Exchange participants and Rotaractors as well as the parents and grandparents of Interactors, RYLA participants, and Rotary Youth Exchange students, and youth exchange host families. 10. Membership leads are available on Rotary.org/membership referral. Make sure to check these often for potential leads in your area. 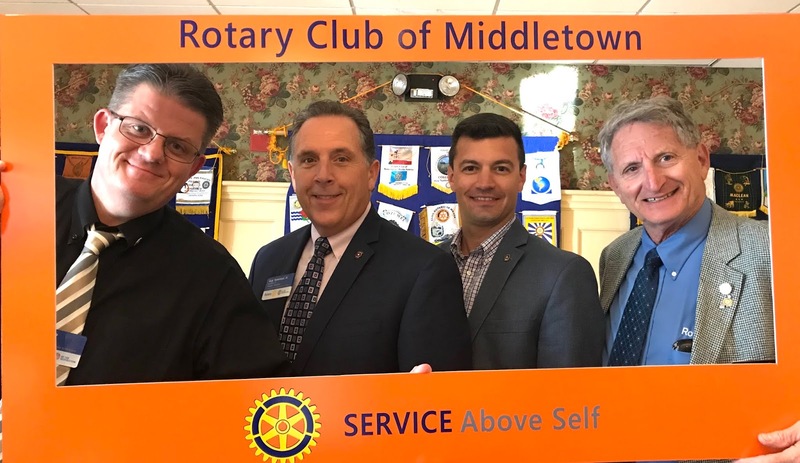 The President of Middletown Rotary Club, Eric Rodko, has had some great programs in July including the Official visit by our Governor. On July 31 he invited the Presidents of nearby Rotary Clubs for a discussion of what makes your club great and how to improve your club. He had Guy Tomassi of Guilford and Daryl Porto of Wallingford as well as me, pinchhitting for Mark Cibula of East Hampton. He asked us three questions and we had a great discussion on how to make our clubs more vibrant. What a great idea for a club program that any of us can do. It fosters interclub interactions and gets us talking about what we like and what we'd like more of in Rotary. 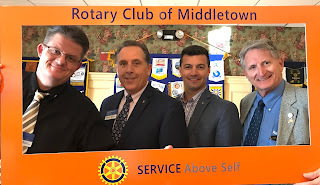 Eric and the three speakers in the Rotary Club of Middletown picture frame. Organize a club event like this at your club. Isn't that picture frame idea neat!